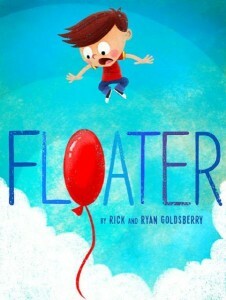 This is a book about a boy who wakes up one day and is floating. Having the practical mom that he does, she still sends him off to school. He floats tethered behind his friend who is riding a bike. Only the kid crashes into trees and stop signs and isn’t all that happy with the situation. Of course this is a day when there is a field trip to the zoo. Which means that the “floater” gets to become really good friends with a lot of animals before accidentally being set free to float all the way up to where an airplane is flying. This book is a classic “what if” that many children will wonder about. And it has an ending that will be sure to get a few smiles. The illustrations are similar to that of many cartoon characters. However, the appeal will be to those kids who have imaginations where the sky is literally the limit. March 23, 2015 in book review, elementary school, fantasy, juvenile, picture books.